The 17 wood-engravings in this set were commissioned from Blake by Robert Thornton to illustrate his school edition of ‘The pastorals of Virgil’. The small volume was published in 1821. 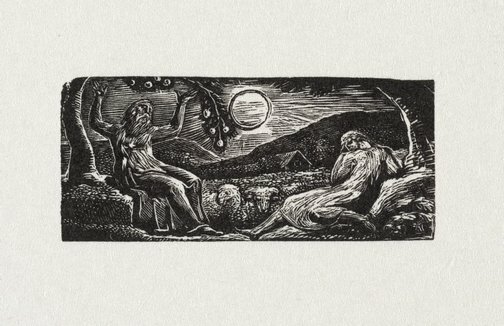 Blake’s designs do not in fact illustrate Virgil’s Latin verses but an imitation of Virgil’s first ‘Eclogue’ by the poet Ambrose Philips. Like Virgil’s original, the imitation takes the form of a dialogue between two shepherds, now renamed Thenot and Colinet. Blake’s illustrations had an enormous influence on a group of young artists known as the Ancients. They included Samuel Palmer and Edward Calvert. Prints & drawings Europe 1500-1900 , Sydney, 2014, coll illus p 159.